A first-round exit in the 2017 Stanley Cup Playoffs officially closed the window of opportunity for current veterans on the San Jose Sharks. Joe Thornton and Patrick Marleau were the catalysts in bringing a Stanley Cup to the Bay Area but to no avail. Doug Wilson has his hands full this offseason as the franchise is at a crossroads. Decisions loom on pending free agents Thornton and Marleau while deciding who to expose for the upcoming expansion draft. One or two players may find themselves in Las Vegas next season. A youth movement could be on the horizon for the Sharks with significant pay raises coming to a few current players. As Wilson ponders the future, here are a few predictions on what could happen in the Sharks’ offseason. When Peter DeBoer named Joe Pavelski captain for the 2015-16 season, a change in the guard was on hand. Thornton and Marleau served as outstanding leaders for San Jose, but both heavily criticized for not delivering in the playoffs. Pavelski has plenty of hockey left to guide the Sharks to a Stanley Cup. A hometown discount would be the only viable option to keep both Thornton and Marleau. For the sake of the franchise, exposing the two veterans to the expansion draft or explore free agency would be best. The two have brought greatness in providing entertaining hockey to Silicon Valley and filling the Shark Tank. 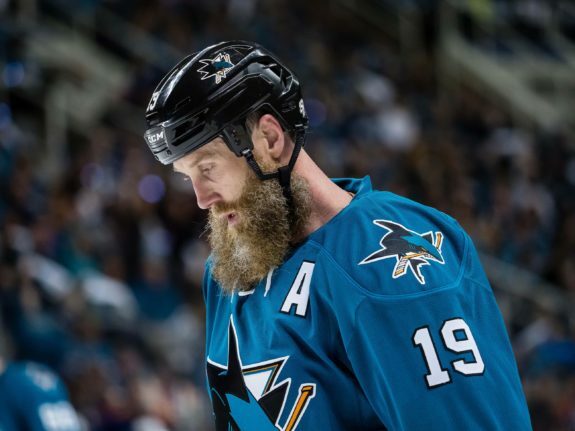 When Thornton arrived in San Jose after the blockbuster trade with Boston, hope was playoff runs would amount to championships. To the dismay, only one Stanley Cup appearance occurred where Pittsburgh walked away as champions. This season, the fatigue from a Stanley Cup appearance last season wore down the two 37-year old veterans. Thornton suffered a knee injury before the playoffs beginning. Through pain, Thornton bravely put out the willingness to sacrifice to help the Sharks. After elimination, DeBoer revealed the extent of Thornton’s injury. Thornton had surgery and hopes to play next season. An issue with re-signing Thornton would be his availability as to when he could be ready for the 2017-18 campaign. His injury was not as significant after the operation, but his compete level at age 37 is a concern. Thornton may not serve as a viable center for the top two lines. He could still be on the top power play unit, but his production could dwindle. The same can be said with Marleau though he would be a better option at re-signing. Marleau has played his whole career in San Jose and would be weird to see Mr. San Jose Shark in another uniform. Tough as this seems, Marleau’s time is up in the Bay Area and should explore other options. Wilson finally got a trade right with goaltender Martin Jones. Throughout San Jose’s playoff history, goaltending did not hold up as the Sharks went deep into the playoffs. Evgeni Nabokov and Antti Niemi provided solid regular season performances but faltered on the big stage. Jones provided the backstopping to finally get the Sharks over the hurdle and into the final. Jones has one year left on his current three-year deal he signed after being acquired by San Jose in a trade with Boston. Expect a significant amount and lengthy term to keep the undisputed starter in San Jose for seasons to come. Hopefully, Jones’ backup can answer the call to take the pressure off the starter. 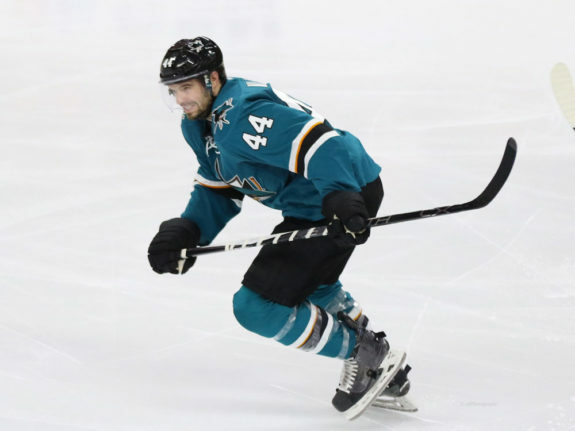 After locking up Jones, defenseman Marc-Edouard Vlasic will get a long extension. Vlasic could fetch around the deal teammate Brent Burns signed during the season. Since his rookie season, Vlasic has been nothing but a shut-down defender. Tasked with shutting down the top units, Vlasic has admirably answered the call and will continue to do so in San Jose. Expect both contracts done before the start of the season. San Jose’s AHL affiliate made the decision of the possible departures with Thornton and Marleau. The San Jose Barracuda reached the Western Conference Final of the Calder Cup Playoffs. Against the Detroit Red Wings’ affiliate, Grand Rapids Griffins, the Barracuda fell in five games. 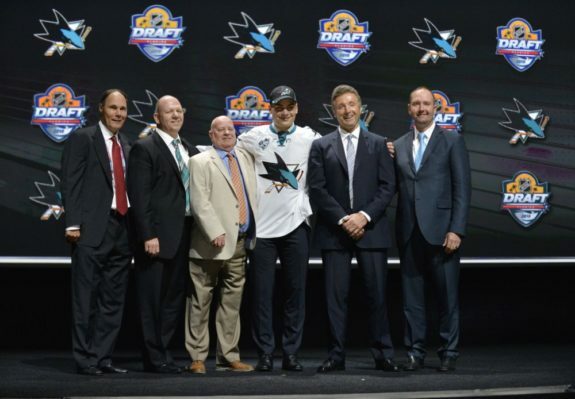 A youth movement is bound to happen as prospects are ready to make an impact with the Sharks. Timo Meier and Kevin Labanc saw significant time with the Sharks, but indications pointed to them not being ready to play full-time at the NHL-level. With the experience gained in the AHL along with a lengthy run in the Calder Cup Playoffs, Meier will likely make the opening lineup this coming season. Along with Meier, defenceman Tim Heed could see more time in the NHL depending on who the Sharks expose to the expansion draft. Justin Braun could depart to Vegas opening a spot. Dylan DeMelo may have the inside edge, but a strong training camp by Heed could force DeBoer’s hand. Other possible Barracuda forwards making the jump to see time with the Sharks are Joakim Ryan, Ryan Carpenter, and Rourke Chartier. All these bold predictions could come into fruition should Wilson make the call. Ultimately, if the Sharks want to stay competitive, youth needs to be inserted into the lineup. Current prospects on the Barracuda made a statement with their playoff run which merits a chance to crack the lineup next season. San Jose fans may not approve of a youth movement, but for a new window of opportunity to open, cleaning house with current veterans is the way to go. An interesting offseason looms for Wilson and the future of the San Jose Sharks. As the clock ticks for the expansion draft in June, priorities better be in place.